As part of the Carmex Blog Squad I recently received a gift set of Carmex Skin Care Products. 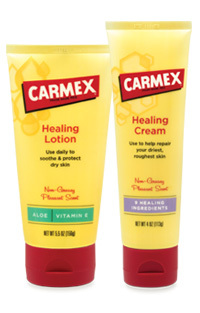 I received a 5.5oz and 1oz tube of Carmex Healing Lotion as well as a 4oz and .75oz tube of Carmex Healing Cream. I have put the 1oz tube of healing Lotion in my purse. It's perfect for this dry time of the year and I didn't already have a lotion in there so this was perfect. Jon has been using the healing cream on his face actually. He wears a CPAP mask (for sleep apnea) and he gets irritated right on the bridge of his nose. So when he wakes up in the morning and a few times throughout the day he's been putting on the healing cream and he says it's been working very well. After just a couple days the irritation cleared up dramatically. So this isn't just for your dry hands and feet. This is great for all parts of your body that need healing! I also use this on my upper arms. They're really dry from eczema and this has been great. The healing lotion is not as thick. It's a bit thinner and rubs it nicely. The cream is much thicker for better protection and it still rubs in nicely, but takes a bit more time. Small tubes are $.99 and the larger ones are $5.99 and come in a squeeze and pump top. I like your new page. I like your new page on FB.